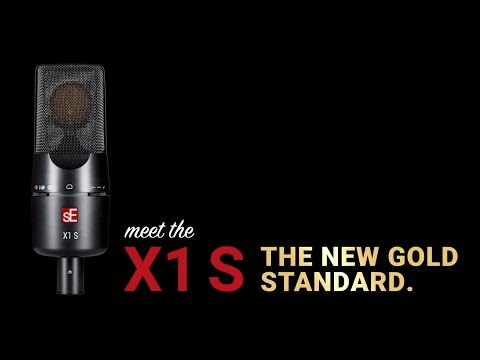 The SE Electronics X1 S Condenser Microphone is an incredible microphone in its own right and is superb value for money. To make this an even sweeter deal for vocalists, this budle package also includes an isolation kit with pop shield and a high quality 3 metre cable! If you're serious about getting the best from your vocal, this is the package for you! The rugged design of the X1 S houses a fixed-cardioid gold-sputtered capsule, with a 10/20dB switchable pad and low-cut bass filter. The grille is made out of steel to give you total reassurance when handling the mic. The new rubberised black paint has been carefully applied to give a supportive feel in the hand, whilst lending itself well to during recordings due its noise damping abilities, which help to minimise any resonant frequencies in the microphone. The large-diaphragm design makes the X1 S a fantastic vocal mic, thanks to its linear frequency response. The timbre of both male and female singers is captured beautifully, allowing an appropriate amount of headroom in the upper frequency range to give a sweetly rounded quality. The max SPL of 160dB will put you at ease when recording directly in front of amplifiers and percussion instruments. Whether pointed directly at the source, offset or distance miked, you can rest assured that the X1 S will perform exquisitely every time without any unwanted noise. For truly professional grade results in a microphone at a low cost, the SE Electronics X1 S Condenser Microphone is sure to impress. As soon as you begin to use it, you'll realise why SE Electronics have such a respected name in the microphone industry and are the consistent choice for artists of all levels.